"Avast there! Splice the mainbrace! Arr, Jim, lad!" 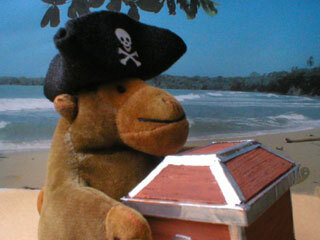 Whether he's ordering his scurvy crew to unleash another broadside, or deciding where to bury his ill-gotten gains, Cap'n Orangetail, Terror of the Spanish Main, always sports his tricorne pirate hat. 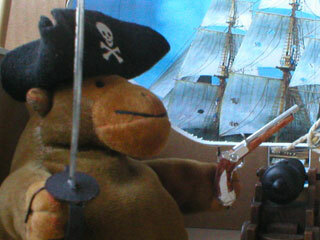 Between voyages, Mr Monkey keeps his piratical hand in with PopCap's "Seven Seas" game (opens in a new window). His cutlass is fashioned from card of various sorts; his pistol has a balsa stock, a biro barrel, a card lock and trigger, and baking foil decorations. The treasure chest is balsa wood with copper fittings, which were painted silver because they looked silly. Mr Monkey's cannon is made by a French firm called Papo, and his rather partial ship is made from bits of cardboard held together by Blu-tak.